As most residents of Singapore would attest, space is a highly sought-after commodity, and one that certainly requires innovative and ingenious apartment design. For many large cities, square metres come at a premium. However, simply because you reside in a compact home, doesn’t mean you need to lose out on functionality, efficiency, practicality and style. 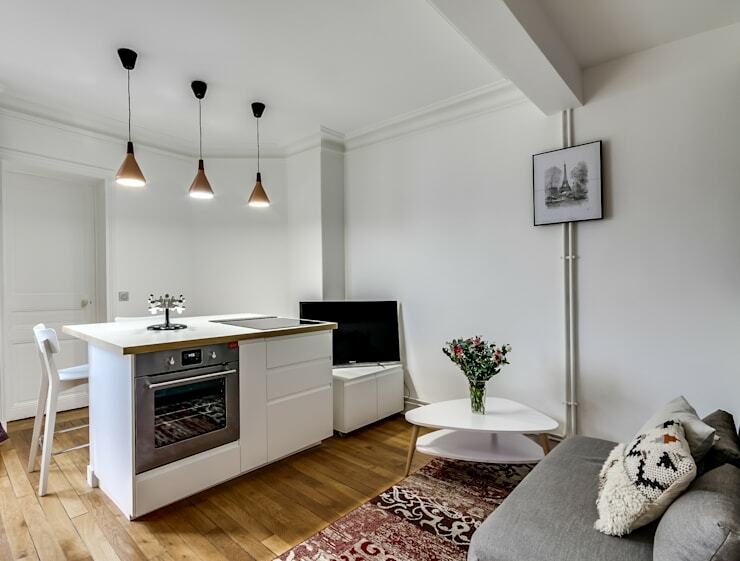 Today on homify we are taking a peek inside a gorgeously impressive dwelling that features a small yet unique floor plan of only 50m2! Comfortable and well designed, this residence has been reconfigured and brought to life thanks to the astute team at Transition Interior Design. Each of the interior spaces have been well integrated, and the apartment is ideal for a young couple or a single occupant. Modern and thoughtful, with a considered approach to innovation, this usable abode is a surprising 50m2 delight! As we head directly into the home we are given a glimpse at the contemporary kitchen with its fitting free joinery. The cooking space features as a central part of this home, with a floating island that provides plenty of preparation area, as well as ample storage for the dwelling. Additionally, we notice the stylish light timber flooring that helps add warmth to the interior areas. The colour scheme is light, bright and creates an element of spaciousness, essential to the comfort and liveability of the living room. Changing our perspective and vantage we see the living areas and television. The room features a subtle and delicate grey fabric upholstered sofa. Colour is added through the use of bright patterned cushions, and replete with a central coffee table. A smaller cupboard holds a space for the television, which turns the simple living room in a media space, ideal for cosying up on a breezy evening with a friend or family. Focusing in on the kitchen we see how the kitchen island features a dining table located behind. 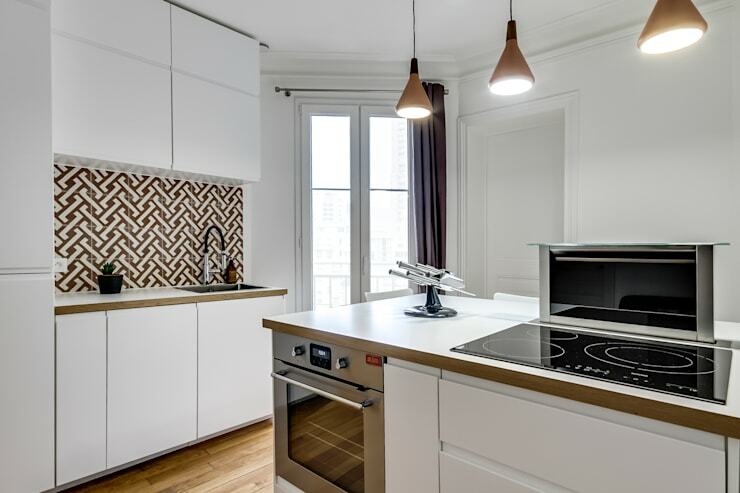 Well organised and practical, an induction stove is set within the island, which provides a place for individuals to gather while food is being cooked. The architects and designers have worked brilliantly in creating a stylish and welcoming space, seamlessly placing three pendant lights above the island, and making the most of the angular floor plan. 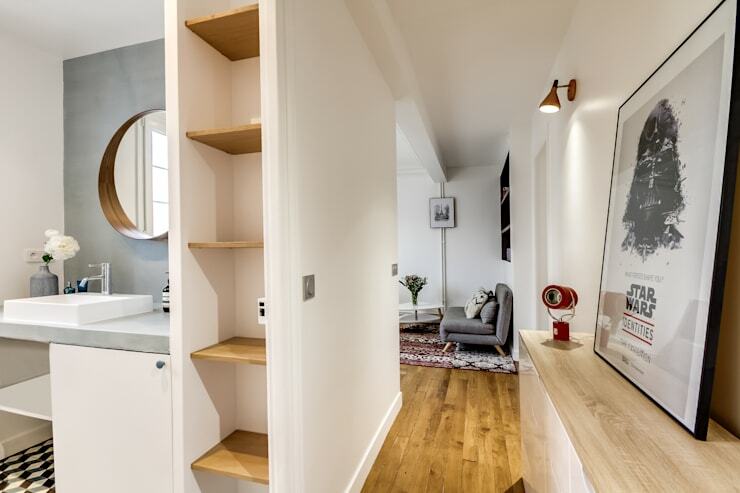 In smaller apartments such as this 50m2 example, it can often be difficult knowing where to store household miscellany and accessories. High cabinets have been added to the left wall, which takes advantage of the limited space within the home. 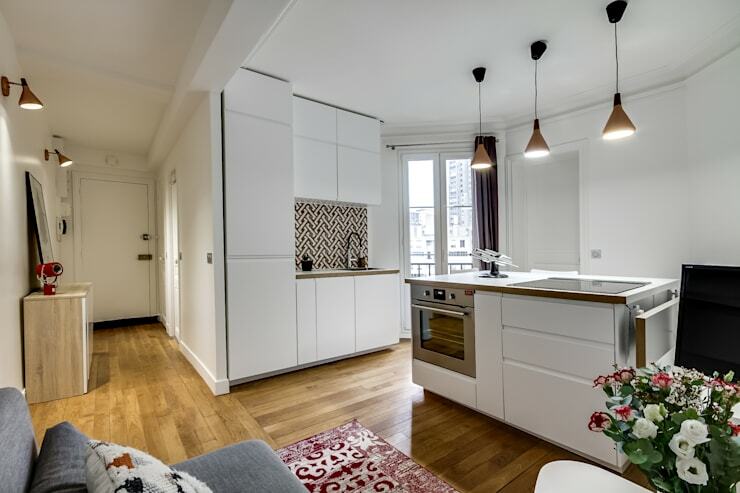 Ideal for storing a range of different domestic odds and ends, the kitchen island also ensures there is plenty of space for accessories and cooking instruments. The French doors bring a huge amount of natural light into the room, while contrasting darker curtains allow the sun to be kept out during hot and humid days. One particularly stylish feature is the tiled splashback. These tiles provide interest within the room, as well as a sense of playfulness and refined elegance. As we wander into the living quarters of this tiny apartment, we are able to see the neat and tidy entrance. The side console is a brilliantly minimalist piece, enhanced by the framed Star Wars poster. The colour scheme is once again a bright off-white hue, with the bathroom seen to the left. Let's take a peek inside! Even though the bathroom is compact, it has been designed brilliantly to maximise every centimetre. The gorgeous retro décor is paired with a dusty pastel colour scheme that adds an energetic yet serene aura. 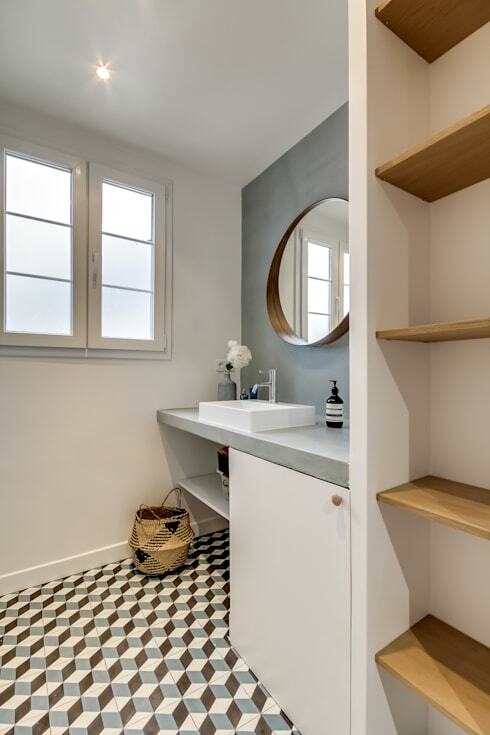 Once again we see the geometric tiling utilised to add character and charm within the home. 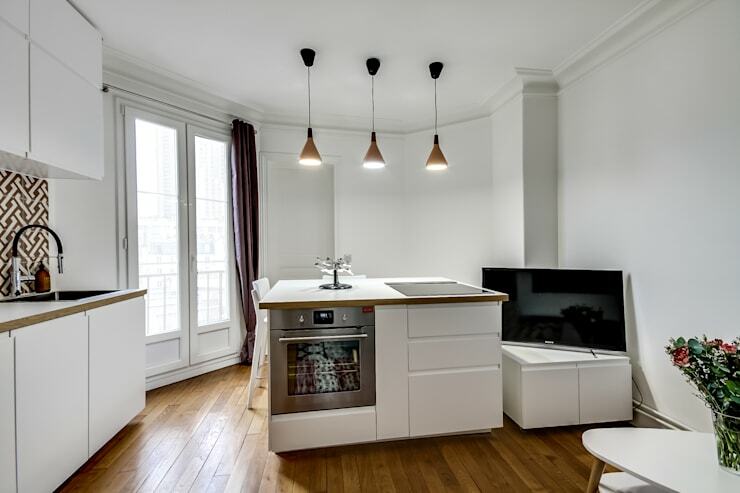 What did you think of this 50m2 apartment? We'd love to hear your thoughts in the comments below!